30 Days or more only! 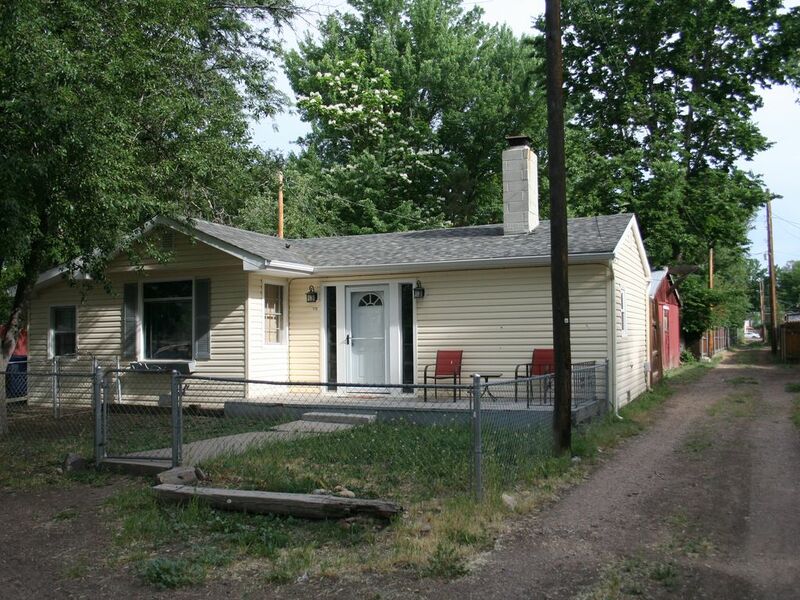 This little cottage is located across the street from the Arkansas river, and two blocks away from the Royal Gorge Railroad Depot. Situated just across the street is the riverwalk, with access to miles of hiking/biking trails. Two blocks from historic downtown Canon City, walk to many activities in the area, dining, entertainment and shopping. The front yard is fenced for furry friends and hosts a private backyard patio with a propane BBQ . Also less than a block away is the historic Robinson Mansion, one of Colorado's top ten. The cottage is fully furnished, all utilities are included as well as wireless internet and Netflix via "Roku". Towels, Sheets, dishes, cookware are all there! This is a minimum 30 day stay VRBO, intended for traveling professionals and relocations. A bi-weekly cleaning service is required and included in the price. Please contact us for additional information. Allison is a Realtor for the entire Front Range, from Denver-Colorado Springs to Pueblo/Canon City- She can list or show you homes on/from all of them. Plus, you can get a discount for lodging if you do your business with her AND save $ on a reduced commission if she helps you sell your Denver home and helps you buy a home in our area. Troy is Retired military and federal employee, he'll be helping you get settled in and is your "go to" if you have any questions/problems during your stay. LOCATION! Allison sold this cottage to a friend of ours back in 2013, when she got married, she decided to sell it.. and we wanted it bad! Its not a big place, but perfect for getting outside and enjoying all CC and the Royal Gorge area has to offer. Location! Directly across the street is the River and River Walk... access to hiking/biking/whitewater/fishing/gold panning.... PLUS, you're 1/2 block away from Veteran's Park that hosts many festivities such as music, farmers market, and much more. 1-2 blocks to Royal Gorge Railroad station, 7 Miles to Royal Gorge Bridge and Park... and TONS more! The Arkansas River is LITERALLY across Riverside, as is the 7 miles of Riverwalk that lead to BLM Hiking and Biking Trails. Fish, Hike, Bike, Raft, Float, Kayak Opportunities are 30 seconds away. 30 Day MINIMUM STAY. Bi-Weekly house cleaning included in price. Located in a quiet neighborhood, across the street from the Arkansas River, Riverwalk and biking/hiking trails. 7 miles to the Royal Gorge Bridge and Park, 1 block from Royal Gorge Rail Road, 1/2 block from summer festivals & activities at Veterans Park. The Riverwalk leads you to the park a block away with a playground, splash park, kids fishing, and protected swimming areas in the Arkansas.